The spelling of Shakespeare’s name was never consistent until well into the 20th century. 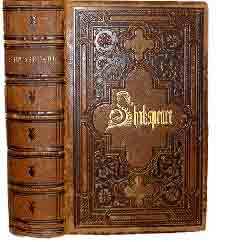 As with this volume of his works, published in 1854, the spelling could be Shakspeare – or even Shakespear, Shakspere or Shake-speare. His own signature also varied (Wikipedia shows several different variations) and sometimes the hand-written signature did not even match the printed version. This handsome leather-bound volume contains his complete works – both drama and poetry – as well as a memoir by Alexander Chalmers and numerous engravings.